The drying cabinet is an all-purpose machine for drying sliced fruits and vegetables. 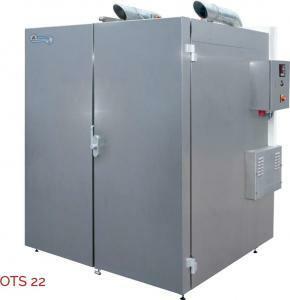 A blanching time in which the contents of the drying chamber are heated to the set temperature can be pre-specified. After reaching this temperature, the actual drying process with controlled air circulation begins. The drying chamber is 100 millimeters thick, insulated, and properly sealed. The casing, frame, and product range are made completely of stainless steel. The ventilation components are made of galvanized sheet steel. The products to be dried are placed on the trays and pushed into the dryer. The process parameters are set and the drying process is started. 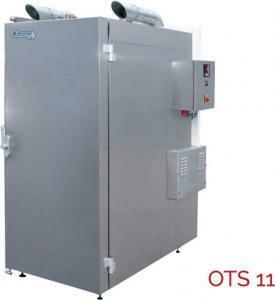 After reaching the pre-set degree of moisture in the chamber or after the set drying time is reached, the drying chamber shuts off automatically.